The world record for a one human being lasting without sleep is 264 hours or 11 days. The average human being, however, needs roughly eight hours of sleep each night to perform decently and feel super-dee-duper throughout the day. 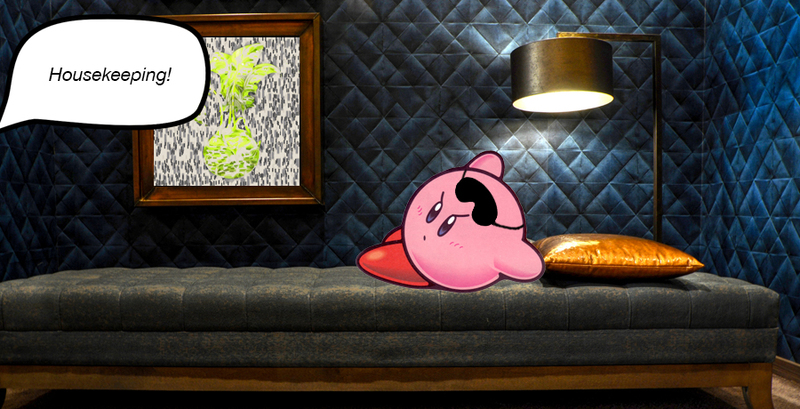 Being awake, too long causes most people to be fatigued and in some cases delusional…and in Kirby’s case, it can take over reality. Think about it. Kirby’s signature copy ability requires Kirby to eat his enemies to gain their powers. This is necessary for Kirby since he is unable to obtain energy from resting. The game even goes so far as to prove this by having Kirby’s copy ability “Sleep”, which does absolutely nothing. Kirby is unable to sleep, and, therefore, the game continues. Every time Kirby attempts to ascend to the real world by sleeping, he can’t do it and is awoken and forced to crawl through his shattered realm of imagination. Another piece of evidence stems from the nature of Kirby games themselves. Kirby’s current catalog of games have been proven to be pretty diverse in design. For instance, having him battling samurai penguins to Kirby exploring an entire world full of yarn. He has been able to copy himself in multiples at will during some games and seems completely unsurprised by splitting his body into clones. This is only possible because of the fragile state of Kirby’s mental state, the imaginary world in his mind that he has dubbed Dreamland. Dreamland can be anything that Kirby imagines, and his imagination is not limited to any rationality due to the lack of slumber. The last piece of evidence is perhaps the most important. Meta Knight. Meta Knight is Kirby’s rival, whose shape and size suggest he may, in fact, be the same race as Kirby. Kirby imagines Meta Knight as himself because Meta Knight represents Kirby’s phycological demons that prevent Kirby’s physical body in the real world to rest. Kirby is constantly at war with his body because he ultimately just wants to sleep but his mind won’t let him. Meta Knight, symbolizing Kirby’s inner demons and worries, won’t allow him to rest and continually seize Dreamland and cause Kirby to stay awake to save his mind. Will Kirby ever finally lay his puffy body to rest? Perhaps. It’s been several years since Kirby has seen a major release, but maybe during the finale of the next installment Kirby will take a much-deserved nap. Film-maker and actor from Oklahoma City. If we hang out and you won't let me be Toad in Mario Kart, we can't be friends.